A Rumpl throw is rugged enough for the great outdoors, with enough coziness and character for the couch. Made with the same innovation found in ultra-thin down-alternative jackets and premium sleeping bags, this durable blanket is designed to be at home in any decor. In nature-inspired colors like Charcoal and Deepwater, with piped edges and contrast stitching, each Rumpl is as smart looking as it is practical. Its lightweight, ripstop nylon is waterproof while resisting stains and odors. And fear not when your Rumpl gets a bit, um, rumpled. A gentle wash in the laundry will clean it right up. Friends and fellow outdoorsmen Nick Polinko and Wylie Robinson created Rumpl after an excursion took an unexpected turn. Stranded in their car in sub-zero weather, they stayed warm under sleeping bags and coats. 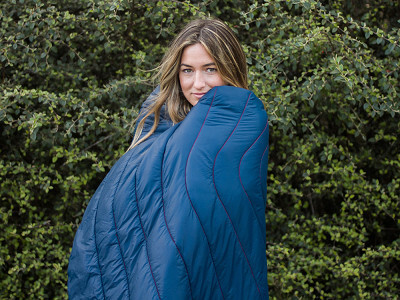 After returning home (unharmed), the duo were inspired to create this versatile blanket with the technology used in outdoor gear. Being two guys on the go, they made Rumpl ready to travel with its own compact carrying bag. Keep Rumpl near the bed or couch for chilly nights, or take it along tailgating, camping or anyplace that could use a toasty, comfy cover. We are Nick and Wylie, the creators of Rumpl - Technical blankets that use the same materials found in premium sleeping bags and puffy jackets. We're excited to partner with The Grommet to offer you our high performance blankets! We look forward to answering any of your questions. Can you tell me what temperature it would be rated for? This is actually a throw blanket, not a sleeping bag so it doesn't have a temperature rating. However, Nick & Wylie probably have a good insight here so I'll be sure to check with them. Stay tuned. @Christine Amy is correct, there is no official rating. We designed it for a balance between warmth and size (packability). We suggest using it as a layer with jacket on cold spring/fall nights, or as a backup warmth on cool summer nights. What are the dimensions of the blanket. Stored in its own case, what is the size and weight? Hi Chris, See below and also on our details tab which you can find when you click on the box that say "buy" in orange. The dimensions (flat) are 50" X 70"
The dimensions (stuffed) are 15" X 6.5"
The blanket weighs 2.5 lbs. Since the Rumple is waterproof, my question is, "Does it breath?" Will it trap moisture on the body side? We know this is an important question for us to answer and want to ensure the correct information is conveyed to you. Stay tuned and we'll be back shortly with concise information. @wayne The technical material is breathable like a high performance ski jacket you might wear in the winter. @Amy @John Our Blanket is rated water resistant thanks to a DWR coating to the fiber that sheds water and oils. Being that only the fiber is coated, it allows for moisture to "breathe" through the fabric and keeps the user from getting to sweaty. The dimensions list 50" by 70", but the video shows it covering a bed (full size?). Was this creative video framing or will it serve as a bedspread for a full or queen bed? The throw blanket should fit comfortably over a twin bed, but won't be big enough for a full or queen sized bed. Great to know there's a need - Josh & Wylie will be listening for sure. Stay tuned. @Amy The size is just big enough to for me (a modest 6'2") to sleep under when I am on the road. However if you wanted to replace a twin/queen/king comforter we will have The Grommet team put you in touch with us directly to discuss other options. @Nick & Wylie 95 bucks for a blanket made in china!!?? C'mon, seriously. @Trent A Patagonia/Mountain Hardware/North Face "puffy" jacket made out of the same material uses 1/4 of the fabric and is 2x+ more expensive as our blanket. We manufacture in China because they are truly the experts at manufacturing with this type of material. A Rumpl throw is rugged enough for the great outdoors, with enough coziness and character for the couch. 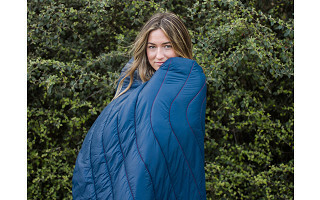 Made with the same innovation found in ultra-thin down-alternative jackets and premium sleeping bags, this durable blanket is designed to be at home in any decor. In nature-inspired colors like Charcoal and Deepwater, with piped edges and contrast stitching, each Rumpl is as smart looking as it is practical. Its lightweight, ripstop nylon is waterproof while resisting stains and odors. And fear not when your Rumpl gets a bit, um, rumpled. A gentle wash in the laundry will clean it right up. Friends and fellow outdoorsmen Nick Polinko and Wylie Robinson created Rumpl after an excursion took an unexpected turn. Stranded in their car in sub-zero weather, they stayed warm under sleeping bags and coats. After returning home (unharmed), the duo were inspired to create this versatile blanket with the technology used in outdoor gear.